Historical Fiction fans, here's a book to add to your TBR list. You're welcome. 1914. Whispers of war are rapidly spreading across Europe as a dark cloud of uncertainty settles over England. 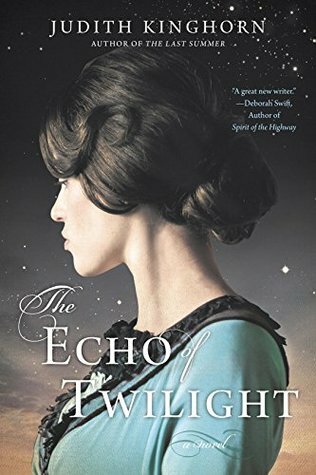 But with the promise of a glamorous new career as a lady’s maid, one young woman’s future has never been so bright in Judith Kinghorn’s new World War I period piece, THE ECHO OF TWILIGHT (Berkley Trade Paperback Original; January 3, 2017; $16.00). Once hired by Lady Ottoline Campbell—a beautiful Northumberland aristocrat—Pearl Gibson cannot help but be swept up into Ottoline’s dazzling world of luxury and scandal. Although at first perturbed by Ottoline’s unusually brazen demeanor, Pearl soon develops a deep and complicated bond with her rather eccentric employer. While accompanying the Campbells on an annual stay in their Scottish summer estate, Pearl unexpectedly falls for Ottoline’s gentle, artistic cousin—but it’s not long before their newly blossoming love affair is ripped apart by the escalating war. As the violence continues to heighten, Pearl and Ottoline fight to survive sorrow and despair at home while the men in their lives continue to be called to the front lines. A must-read for fans of Kate Morton, Natasha Solomons and upstairs/downstairs dramas such as Downton Abbey, THE ECHO OF TWILIGHT offers an inspiring story of the unexpected strength and love that can be found in war’s darkest hours. Thanks to Berkley, I have a paperback copy to give away to a lucky reader. You must be at least 13 years old to enter. You must have a US address. Good luck! A novel which I loved and was captivating and memorable was Stolen beauty by Laurie Lico Albanese. The last book I absolutely loved was Rain Reign by Ann M. Martin. What Makes a Good Travel Writer? March Signups for NBOTB is open!